Inspect and tighten all electrical connections as needed. Remove, clean and adjust main gas burners as needed. Inspect combustion blower for lint and debris, clean as needed.. Inspect ignition and pilot assembly. Visual inspection of heat-exchanger(s) & combustion chambers for cracks, rusting, or problem areas. Inspect all furnace safety controls. (safety limits, rollout switches, fan controls). Inspect unit for gas leaks. Inspect flue system, check for obstructions. Adjust blower for correct airflow. Inspect thermostat and verify proper operation. Measure and record electrical voltage and amperages. Inspect system transformers, relays, contactors, and controls. 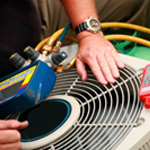 Measure supply and return air temperatures. Complete and present checklist and report. Lubricate all motor and fan bearings. Inspect evaporator coil and drain pan when readily accessible. Inspect and tighten all electrical connections. This includes disconnect switch. Verify proper operation of system starting and run capacitors. Inspect all controls, relays, transformers, contactors and motors. Test system for proper airflow. Check and record super-heat and sub-cooling. Verify proper operation of defrost controls. Complete and present comprehensive checklist and report. Advise customer on ways to reduce energy, improve safety, and enhance comfort. Detailed inspection checklist and recommendations of any potential problems we may have found during your service visit and make recommended repair options.